James D. Watson, Ph.D., has been reunited with the Nobel Prize he sold at auction last year—a medal he won in 1962 for co-discovering DNA’s double-helix structure. The winning bidder—Alisher Usmanov, a billionaire listed by Forbes as Russia’s richest man—said today he has followed through on a promise to return the prize to Dr. Watson. Usmanov, the founder of USM Holdings and a philanthropist, made the winning $4.1 million bid, but quickly said he would give the prize back to Dr. Watson because he was one of history’s greatest biologists. “It was a huge honor for me to be able to show my respect for a scientist who has made an invaluable contribution to the development of modern science. These kinds of awards must remain with their original recipients,” Usmanov said in a statement. The first living researcher to auction his Nobel medal, Dr. Watson fetched the highest price ever for a Nobel medal by anyone, living or dead. 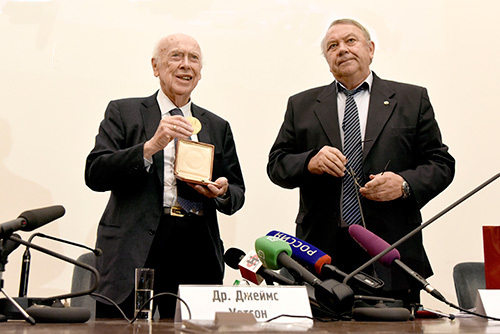 The transfer of the medal to Dr. Watson took place during a ceremony at the Russian Academy of Sciences (RAS), whose president, Professor Vladimir Fortov, Ph.D., returned the medal on behalf of Mr. Usmanov. “My goal was achieved after buying James Watson’s Nobel Prize medal, as the money from the sale went towards supporting scientific research and the fight against cancer,” Usmanov added, in remarks delivered by Fortov at the ceremony. Bloomberg and Forbes have ranked Usmanov as Russia’s most generous charity benefactor in 2013 and again last year. Usmanov’s bid exceeded projections by Christie’s that the medal would sell for between the $2.5 million reserve price and $3.5 million. After adding a buyer’s premium directed to Christie’s, Dr. Watson’s medal formally sold for $4.76 million. By selling his Nobel Prize medal, Dr. Watson told the Financial Times late last month, he hoped the resulting publicity will enable him to “re-enter public life.” He retired as chancellor of Cold Spring Harbor Laboratory (CSHL) in 2007 after the Sunday Times of London published comments in which he connected intelligence to race. He remains with CSHL, holding the position of chancellor emeritus.